The following are the steps to install VerseVIEW with Burmese translation. 4c) Select the unzipped file and click OPEN. Then click CLOSE on the “Bible Version Manager” dialog box. 4d) Then click Bible > Select Version from the top menu and select version 2 as Burmese and click SAVE. 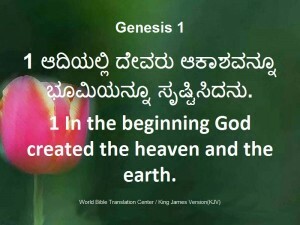 There after, VerseVIEW will open with English KJV and Burmese translations every time. 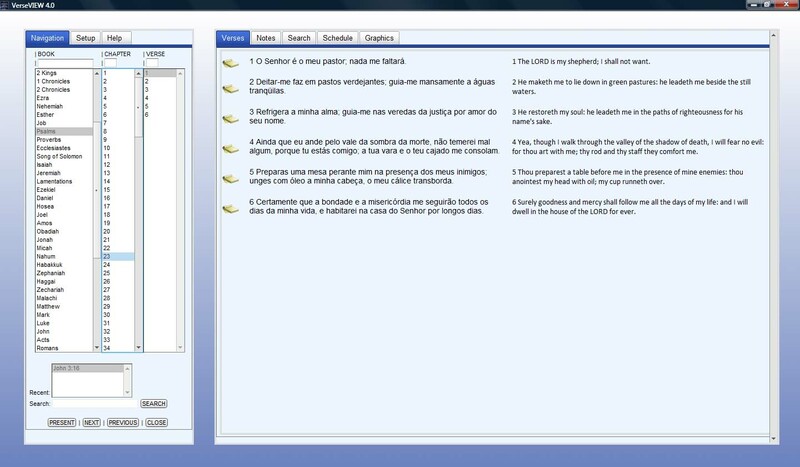 We can choose any two translations to be displayed on VerseVIEW Navigation and Presentation. Contact verseview@yahoo.com for any questions or comments. VerseVIEW – Gratuita Software suporta Bíblia Português Bíblia (João Ferreira de Almeida Atualizada). VerseVIEW pode ser usado para apresentar os versículos da Bíblia na Igreja e para a leitura da Bíblia em casa. Por favor, veja as fotos abaixo. Se você precisar de alguma ajuda com a instalação VerseVIEW, por favor me envie um e-mail. Além disso, se você encontrou VerseVIEW útil, por favor avise seus amigos e familiares sobre VerseVIEW. 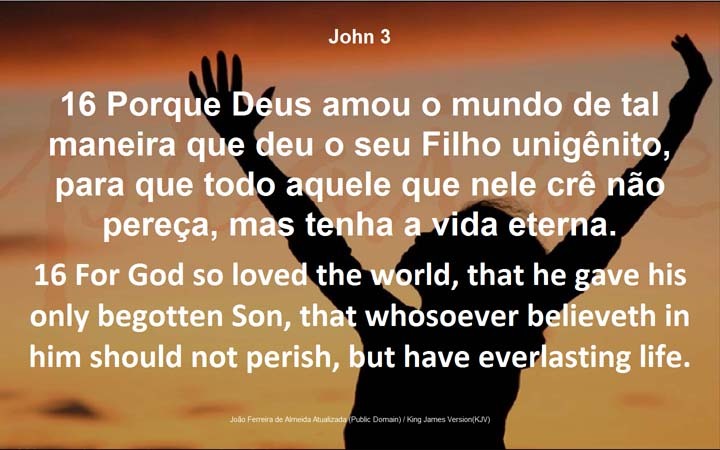 VerseVIEW – Free Bible Software supports Portuguese Bible (João Ferreira de Almeida Atualizada). VerseVIEW can be used to present Bible verses in Church and for reading Bible at home. If you need any help with VerseVIEW setup, please send me an email. Also, if you found VerseVIEW useful, please tell your friends and family about VerseVIEW. Kannada Bible translation from World Bible Translation Center (WBTC) has been added to VerseVIEW. It also contains word/phrase search database.